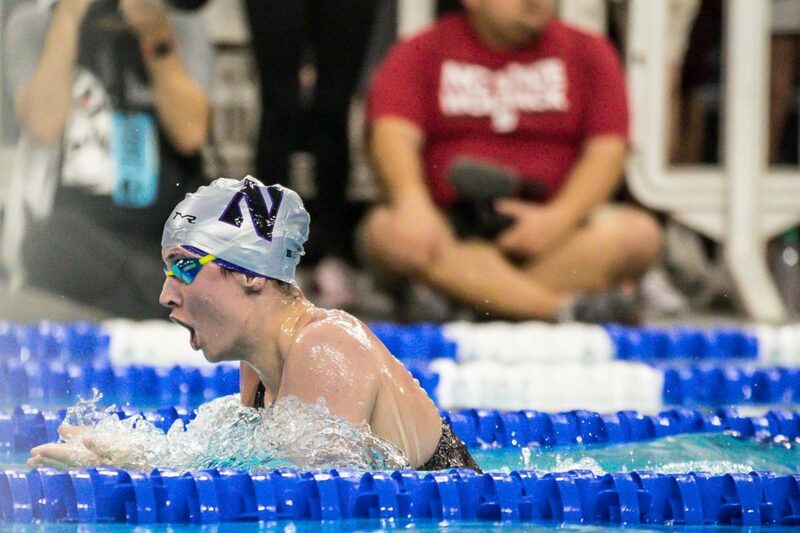 Northwestern sophomore Calypso Sheridan qualified for the A-final of the 400 IM with a new lifetime best and school record Friday morning at the 2019 Women’s Division I NCAA Championships, making her the team’s first A-finalist in swimming since 2012 and sixth since 2000. Sheridan went 4:04.30 (54.60/1:00.94/1:09.90/58.86) for the No. 4 spot heading into finals. She was the No. 12 seed coming into the meet, though we had picked her as the “dark horse” to make the A-final. 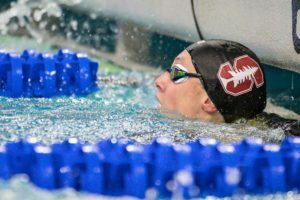 Sheridan was 22nd at last year’s NCAA Championships, and had swum a lifetime best 4:05.93 at Big Tens last month, as well as in her 200 IM, 200 breast and 100 back. 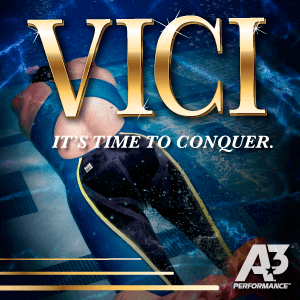 She also went a 100 breast best in a March 1 last chance swim. 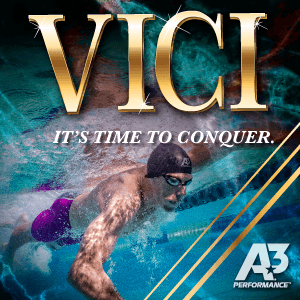 She also seemed to be in great shape judging by a five-second drop in the long course 400 IM at the Des Moines Pro Swim Series between Big Tens and NCAAs. Notably, Sheridan is swimming under Northwestern‘s new head coach Jeremy Kipp, who arrived in Evanston last summer after three years as head coach at Boise State. 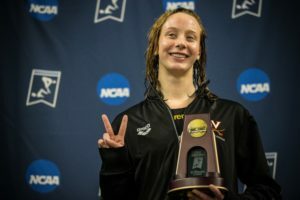 She swam her freshman season under Abby Steketee, who stepped down without publicly providing an explanation after three seasons with the team last April (her husband Steve Steketee was named an assistant on Sergio Lopez’s new staff at Virginia Tech over the summer). Northwestern‘s last A-finalist in swimming was 100 breaststroker Jenny Wilson in 2012, who finished eighth in finals. 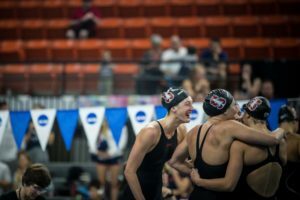 In the 21st century prior to Wilson, there was 200 freestyler Andrea Hupman in 2008, 200 flyer Merritt Adams in 2002, and 100/200 breaststroker Amy Balcerzak (who A-finaled in 1997-2000) and 50 freestyler Courtney Allen in 2000. The Wildcats have had many divers make the top eight, and a handful of swimmers make the B-final.